A well balanced, colourful soup designed for cool weather. A little bit Indian & a little bit Moroccan, and so easy to make! sour cream, Parmesan & chopped green onions for topping. Heat the oil in a pot. Add chopped onions and sauté until fragrant. Add turmeric, cumin & thyme & continue to sauté for a couple of minutes. 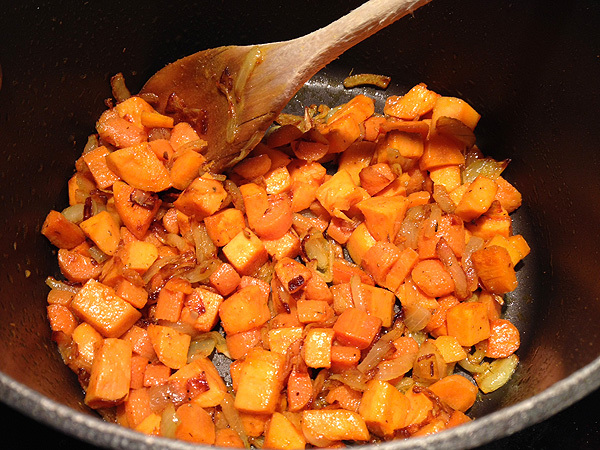 Add chopped sweet potatoes and carrots and cook for a minute or so, while stirring. Now add rinsed lentils, water, sea salt and pepper, cover and let simmer for 20-25 minutes until the vegetables and lentils are soft. 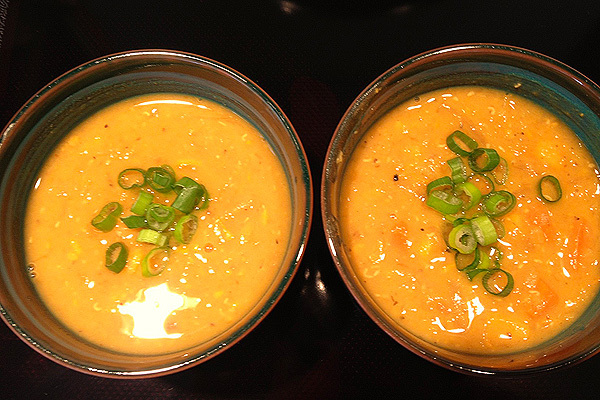 Now, there are two options for serving this delicious soup: 1) with an immersion blender, puree the soup for a silky, smooth texture or 2) mash some of the veggies with a spoon but leave the vast majority as is for a more chunky soup. Taste and adjust for salt & pepper. Serve the soup in bowls, topped with a spoon full of sour cream, a touch of Parmesan & chopped green onions for a little drama & bite.